This review focuses on the updated 2017 model Zhiyun Rider-M Action Camera Gimbal Stabilizer with GoPro Hero 5 bracket. To my knowledge, the only difference between this latest model and the previous model released which has the GoPro Hero 4 image on the box is that this model comes standard with the GoPro Hero 5 bracket and the latest firmware. If you have never heard of this model gimbal before, then I suggest that you read some of its features, functions and specifications found here before delving into my review. 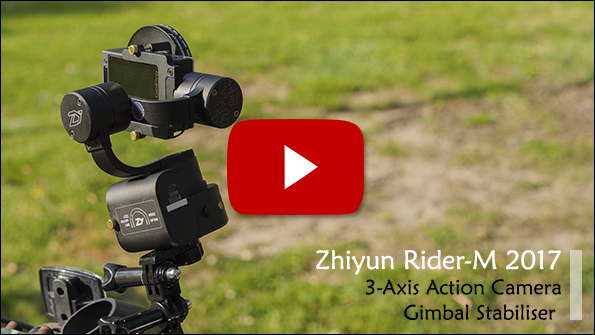 The video below demonstrates the results of my tests in various situations using the Zhiyun Rider-M gimbal stabiliser with a GorPro Hero 4 action camera. GoPro and gimbal facing to the side while moving forward. Good number of useful accessories included in the kit that covers all the basic uses. Well packaged and organisation of contents in the box. Stabilizes the footage very well in comparison to not using a gimbal with the GoPro Hero 4, but this is under certain conditions. Mounting the gimbal on the bike handle bars provided the least desirable results but it provided a better horizon or focal point in the footage compared to not using one. 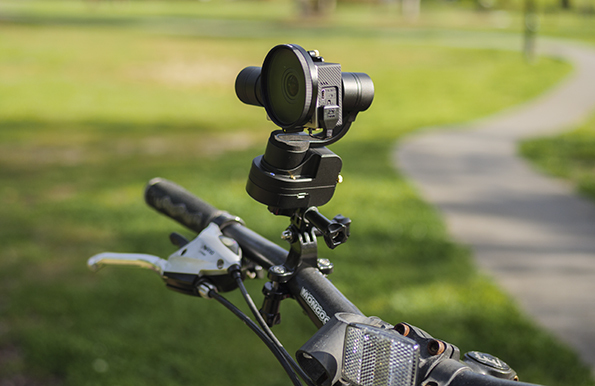 A sturdier or more controlled mounting source could help improve the performance of the gimbal when riding. Some videos online suggests that mounting the gimbal on a helmet or a chesty may provide better stability and results when filming a riding scene. It excelled very well as a handheld gimbal when walking. I did find further issues with using the gimbal which I have outlined in the Cons section. Non-propriety and interchangeable batteries help ensure longer use of the unit through battery changes of backup batteries. Ability to charge the GoPro camera while using the gimbal prolongs the continuous use of the GoPro. The optional padding sticker that you can place on the Pan Axis helps soften any knocks from the GoPro when it swings freely. This is very useful at preventing scratches or damage to your GoPro or the gimbal. Even though the GoPro mount for this 2017 Rider-M is for the Hero 5, the Hero 4 still mounts but with gaps at the top and bottom of the Gopro as shown in the image below. The Gopro can easily be removed by loosening the two screws and sliding the GoPro in or out. I would rather choose this model than the previous model gimbal because the previous model would limit my choice to the smaller GoPro 4 camera or similar. I would need to purchase an additional bracket if I were to use the previous model gimbal with the GoPro Hero 5. This is an excellent selfie stick that is easy to use and seems to be of good quality. Always check to make sure that the ball mount is fastened properly otherwise your GoPro could swing loose unexpectedly. They seem like strong motors judging from the firmness when the axis arms are moved manually to apply the hold and lock feature. The gimbal coped with stabilising my GoPro Hero 4 with a 52mm UV filter and filter mount attached, and mounted on the included selfie/extension rod, while walking or running. It did not perform so well when it came to the riding tests though. The Rider-M can be used without having a permanent handle attached like other handheld gimbals on the market. You can also attach an included extension rod for selfie style use if required. The design of the unit is compact and can be left sitting upright or handheld which can be useful for quick use. A triple click of the mode button will rotate the camera 180 degrees for selfie use. In this mode, you can still modify the gimbal to the other modes while retaining the selfie position. The Power On/Off button is small and in a poor position that is hard to reach. I think the button should be placed at the front of the gimbal. The gimbal occasionally twitches when attached on the bike handle bars. This issue only appears when mounted on the handle bars where the gimbal would shake profusely. The further the GoPro is away from the mounted source(handle bars), the more the gimbal would shake. It is best to have the GoPro mounted as close as possible to the mounted source so that there is no leverage to emphasise the shakes caused by bumps on the roads, poor steering, etc. Zhiyun App does not function on Android 4.4. It crashes when trying to start the app. The Gopro froze once during these tests and that was with the charging cable from the gimbal to the Gopro attached. I had to remove the battery from the Gopro and restart it to fix this issue. All footage in this review was performed with the charging cable attached. It is confusing on how to set the gimbal to the Pan Following mode operation. I was unable to verify the proper process of getting into this mode. Clicking twice would either access the Pan Following Mode or the Following Mode. The difference between the two modes, is that the Pan Following Mode only follows the pan position unlike the Following Mode that also follows the tilt as well as the pan. The manual has not properly addressed this process. Encoders are not used on this gimbal and based on the benefits of encoders described by other gimbal products, I think the Rider-M could benefit from this technology. This feature seems to be only available when in Locking mode. I was unable to use this for the other modes. This is rather disappointing since this feature is very useful at re-aligning the horizon when it is not straight or if you want to make a creative horizon adjustment in the other modes. I was unable to use this gimbal upside down. I have tried starting from upside down and it would try to force itself in a different angle and be stuck up against the turning limits of the axis. I have tried manually hold and locking it upside down but to no avail. The connector and cable is weak and the connector is hard to remove when plugged in. Listening for motor noise when outdoors is negligible at arm’s length but noticeable if you place your ear next to the gimbal motors. Though there has been some thin padding applied where the motor to the bracket axis is, the motor noise can still be heard in quiet locations using the GoPro Hero 4 inbuilt mic. In outdoor locations, the environmental noise can mask the motor noise but it depends on how much stabilising is being performed by the gimbal. Still this motor noise is unacceptable if you intend to use audio with your footage. The leak of the motor noise may be reduced by using some form of external or directional mic with your GoPro. There should have been some form of gimbal support supplied to help you transport the gimbal without the arms knocking the body or damaging the axis. 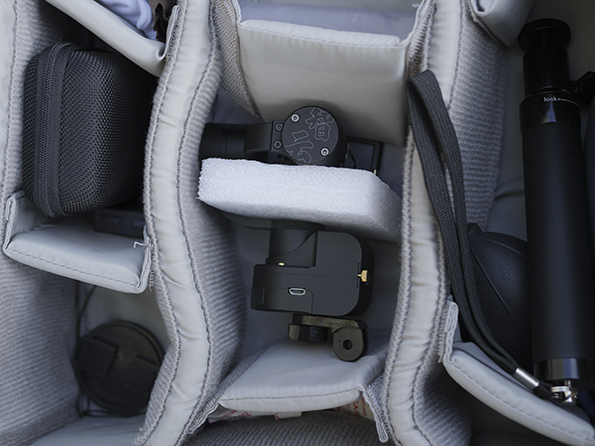 Something similar to the support attachment provided for the DJI Mavic drone when storing or transporting the drone would be useful. I have custom made my own gimbal transportation support using packing foam as shown in the images below. It is a little inconvenient having to attach when storing the gimbal, and detach when using the gimbal, but I believe this support will help minimise damage caused to the unit when transporting it in my backpack, which is prone to being knocked around. Prototype version 2 in use on the Rider-M with Gopro Hero 4. 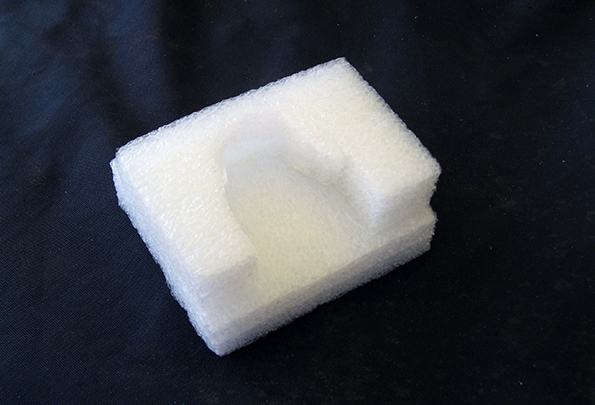 Two pieces of packing foams cut into shape with a box cutter and glued together using UHU adhesive. This unit should at least be water resistant since it’s purpose is to stabilize an action camera that would be exposed to various environmental conditions – rain, humidity, dust, wind, etc. I think this gimbal is a big and heavy addition to an action camera. It defeats the purpose of why I purchased an action camera in the first place which was for its size, portability and convenience. In context to GoPro gimbals against other gimbals, the Rider-M may be small and light but when you attach this unit to the GoPro, it places the whole package more in line with a camcorder. I look forward to the day when action cameras have maturely evolved to include inbuilt image stabilisation that perform as well as the IBIS stabilisation found in the Panasonic GH5 mirrorless camera. The manual provided seems limited, a little confusing or lacking in some areas. It does not go into greater details on specific areas such as Modes. 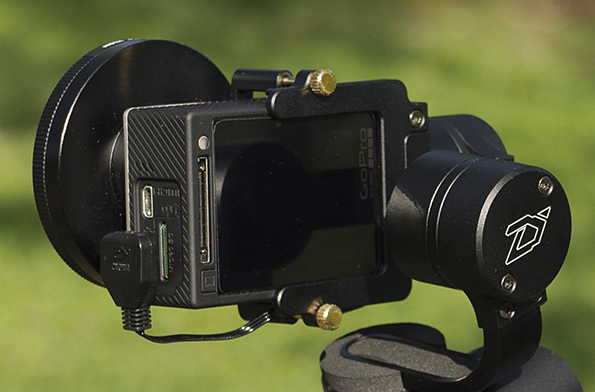 The Rider-M should be mounted firmly and close to the part that you are attaching the gimbal to. If the mounting arms are too long, the size of any shakes are exaggerated. The axis have turn limitations. This may be prone to wear or damage from constant knocking at the stops when the gimbal is swinging freely when it is off. I do not believe that this could be fully eradicated since the camera mounts against the motors but minimising as it is now, would be very useful for talking over your footage especially for vloggers. 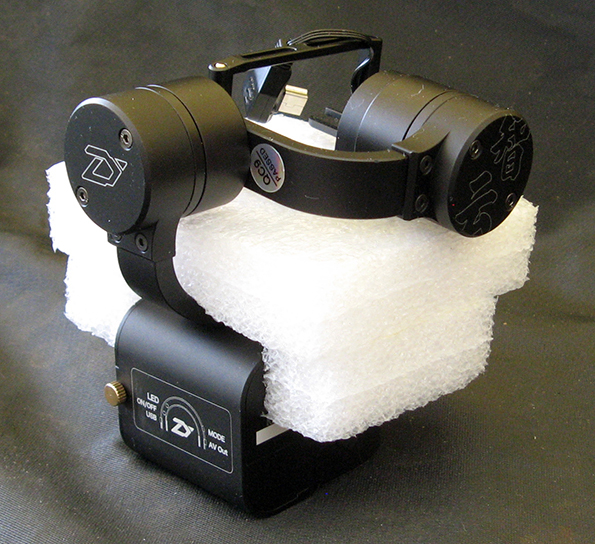 Design the gimbal in such a way where the lens is at the central position when mounting the camera to the gimbal. This has various benefits such as helping with balance if lens accessories are attached as well as aesthetics in the footage when tilting left and right. Other feedback and suggestions are included in the Pros and Cons section. This is a very good Action Camera Gimbal Stabiliser that is effective at stabilising footage depending on how it is being used. I would not attach this to a source that consistently shakes profusely as it will result in undesired twitches as shown in my tests. The gimbal does not remove all shakiness when shooting as I can still see micro-jitters in the footage especially when it is viewed at its full 1920 x 1080 resolution, but in comparison to not using a gimbal, it is still a dramatic improvement that can produce useful results. If you find your current action camera footage unacceptable due to the amount of unwanted shakes or movement, then I recommend that you try a gimbal stabiliser. Software stabilisers is an option to help stabilise shaky footage but they tend to produce unwanted artefacts if applied excessively. Using software stabilisers moderately in conjunction with a gimbal stabiliser should produce better results. 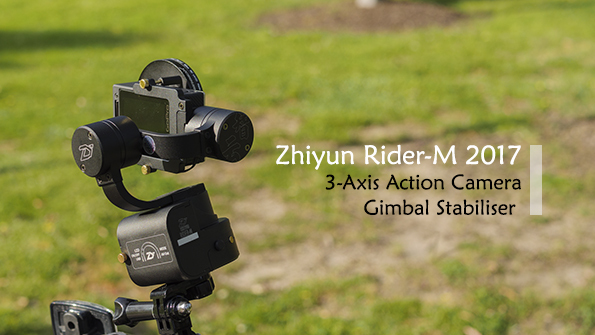 The Zhiyun Rider-M gimbal provides a significant improvement in minimising shaky footage but at a cost of price, portability and convenience. This unit is not cheap and will add costs to your action camera system, the gimbal and its accessories will take up space when you travel, and when you need to record a scene, you will need to consider using two devices and not just one. These are some points you should consider before buying a gimbal for your action camera otherwise you may be left with a gimbal that you may not end up using once the novelty wears off. A very good gimbal that is effective at stabilising footage depending on how it is being used. There are still some areas of concerns in regards to the issues that I encountered using this gimbal. These issues may be deal breakers for users who require a reliable unit that will stabilise footage consistently in various action packed situations.